, Lord Ashburton, an eminent lawyer, was the second son of Mr. John Dunning, of Ashburton, Co. Devon, attorney at law, by Agnes, daughter of Henry Judsham, of Old Port, in the parish of Modbury, in the same county. He was born at Ashburton, Oct. 18, 1731. At the age of seven he was sent to the free grammar-school of his native place, where, during five years, he made an astonishing progress in the classic languages. A book in Homer, or in the Æneid of Virgil, he would get by heart in the course of two hours, and on the top of the school-room, which was wainscotted, he drew out the diagrams of the first book of Euclid, and solved them at the age of ten. He has often been heard to say that he owed all his future fortune to Euclid and sir Isaac Newton. When he left school he was taken into his father’s office, where he remained until his attaining the age of nineteen, at which time sir Thomas Clarke, master of the rolls, (to whom his father had been many years steward) took him under his protection, and sent him to the Temple. 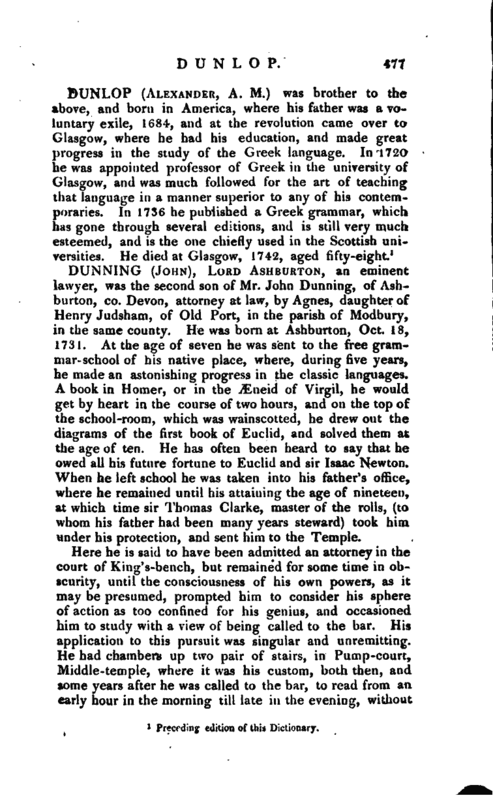 Here he is said to have been admitted an attorney in the court of King’s-bench, but remained for some time in obscurity, until the consciousness of his own powers, as it may be presumed, prompted him to consider his sphere of action as too confined for his genius, and occasioned him to study with a view of being called to the bar. His application to this pursuit was singular and unremitting. He had chambers up two pair of stairs, in Pump-court, Middle-temple, where it was his custom, both then, and some years after he was called to the bar, to read from an early hour in the morning till late in the evening, without | ever going out of his chambers, or permitting any visits from his fellow students. He then dined, (or rather made his dinner and supper together,) either at the Grecian or at George’s coffee-house. In this way he accumulated a vast stock of knowledge, which, however, for a considerable time he had no opportunity of displaying. When admitted to the bar, he travelled the western circuit, but had not a single brief; and the historian of Devonshire says, had Lavater been at Exeter in 1759, he must have sent counsellor Dunning to the hospital of idiots. Not a feature marked him for the son of wisdom. Practice came in so slowly, that he was three years at the bar before he received one hundred guineas; but at length he was enabled to emerge from this state of obscurity, and commence that career which led to fame, opulence, and honours. In 1759, the authority of the French in the East Indies was entirely overthrown by the English victories in that part of the globe. The great accession of power which was thus thrown into the successful scale, excited the jealousy of the Dutch, who, after some disputes in the country, transmitted their complaints home in form against the servants of the English East India company, as violators of the neutrality, and interrupters of the Dutch commerce. 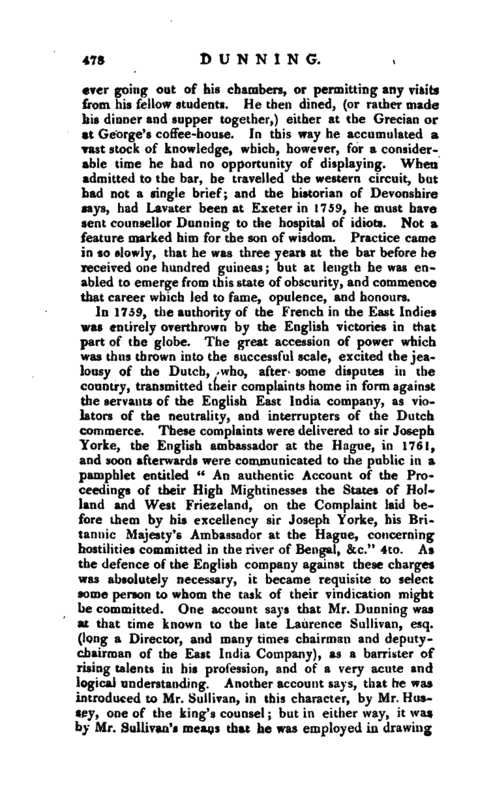 These complaints were delivered to sir Joseph Yorke, the English ambassador at the Hague, in 1761, and soon afterwards were communicated to the public in a pamphlet entitled “An authentic Account of the Proceedings of their High Mightinesses the States of Holland and West Friezeland, on the Complaint laid before them by his excellency sir Joseph Yorke, his Britannic Majesty’s Ambassador at the Hague, concerning hostilities committed in the river of Bengal, &c.” 4to. As the defence of the English company against these charges was absolutely necessary, it became requisite to select some person to whom the task of their vindication might be committed. One account says that Mr. Dunning was at that time known to the late Laurence Sullivan, esq. (long a Director, and many times chairman and deputychairman of the East India Company), as a barrister of rising talents in his profession, and of a very acute and logical understanding. Another account says, that he was introduced to Mr. Sullivan, in this character, by Mr. Hussey, one of the king’s counsel; but in either way, it was by Mr. Sullivan’s means that he was employed in drawing. | up the defence, which was published under the title of “A Defence of the United Company of Merchants of England trading to the East Indies, and their Servants (particularly those at Bengal), against the Complaints of the Dutch East India Company; being a Memorial from the English Company to his Majesty on that subject,” 1762, 4to. This memorial, which produced a conciliating answer and proper redress from the Dutch government, was esteemed a master-piece of language and reasoning, and was so perfectly satisfactory both to government and the East India Company, that it is said the latter presented him with a bank-note of 500l. : but he derived his highest reward from the fame it procured him; and as he now became known to the public for high talents, his profession afforded him a constant security for having those talents well employed. In 1763 an opportunity occurred of signalizing himself in an affair which could not fail to make him popular. Wilkes had now begun to make a figure in the political world, and by the injudicious conduct of the administration, was rendered a man of that consequence which neither his character nor abilities could have otherwise made him. 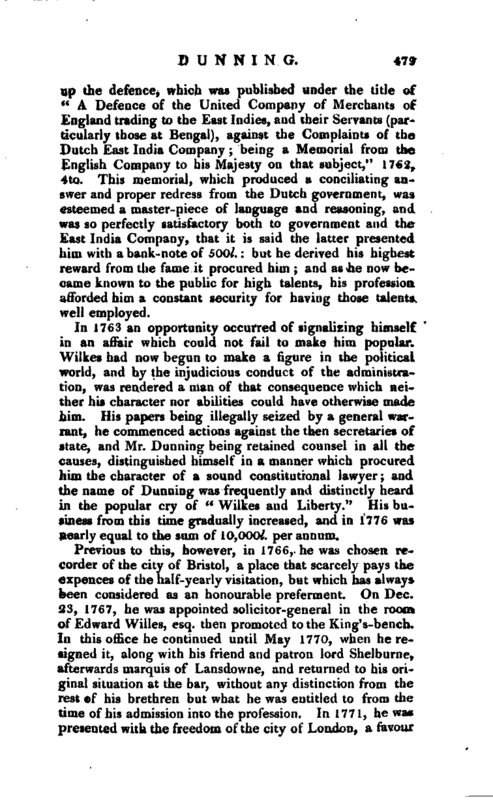 His papers being illegally seized by a general warrant, he commenced actions against the then secretaries of state, and Mr. Dunning being retained counsel in all the causes, distinguished himself in a manner which procured him the character of a sound constitutional lawyer; and the name of Dunning was frequently and distinctly heard in the popular cry of “Wilkes and Liberty.” His business from this time gradually increased, and in 1776 was nearly equal to the sum of 10,000l. per annum. Previous to this, however, in 1766, he was chosen recorder of the city of Bristol, a place that scarcely pays the expences of the half-yearly visitation, but which has always been considered as an honourable preferment. On Dec. S3, 1767, he was appointed solicitor-general in the room of Edward Willes, esq. then promoted to the King’s-bench. In this office he continued until May 1770, when he resigned it, along with his friend and patron lord Shelburne, afterwards marquis of Lansdowne, and returned to his original situation at the bar, without any distinction from the rest of his brethren but what he was entitled to from the time of his admission into the profession. In 1771, he was presented with the freedom of the city of London, a favour | which he acknowledged in a letter written with elegance, yet caution. From the period of his resignation he was considered as adhering to the party in opposition to the administration which conducted the American war, and distinguished himself by many able speeches in parliament, of which he was first chosen member for Calne in 1768, and continued to represent the same borough until he was called to the peerage. On the change of administration in 1782, which he had laboured to promote, he was appointed through the interest of his friend lord Shelburne, chancellor of the duchy of Lancaster, one of the places against which he and his friends had often objected as useless and burthensome to the public; and was about the same time advanced to the peerage by the title of lord Ashburton, of Ashburton, co. Devon. This honour, however, he did not long survive. His constitution, not perhaps originally good, was now worn down by indefatigable labour in his profession, and he died on a visit to Exmouth, August 18, 1783. His lordship married in 17SO, Elizabeth, daughter of John Baring, of Larkbear, co. Devon, esq. sister to John Baring, esq. M. P. for the city of Exeter at that time, and to the late sir Francis Baring, bart. By this lady he had two sons, John, who died in infancy, and Richard Barre, the present lord Ashburton. Few men, in a career requiring the gifts of voice, person, and manner, had ever more difficulties to struggle with than the late lord Ashburton. He was a thick, short, compact man, with a sallow countenance, turned-up nose, a constant shake of the head, with a hectic cough which so frequently interrupted the stream of his eloquence, that to any other man this single defect would be a material impediment in his profession; and yet, with all these personal drawbacks, he no sooner opened a cause which required any exertion of talent, than his mind, like the sun, broke forth in the full meridian of its brightness. His elocution was at once fluent, elegant, and substantial, and partook more of the knowledge of constitutional law than that derived from the old books and reporters; not that he wasdeficient in all the depths of his profession, when an absolute necessity called him out (his praise being that of the best common lawyer as well as the best orator of his time); but his general eloquence partook more of the spirit than the letter of laws. His diction was of the purest and most. | classical kind not borrowed from any living model of his time, either in the senate or at the bar it was his own particular formation and if it had any shade, it was perhaps its not being familiar enough, at times, to the common ear: he was, however, master of various kind of styles, and possessed abundance of wit and humour, which often not only ’; set the court in a roar," but drew smiles from the gravity of the bench. 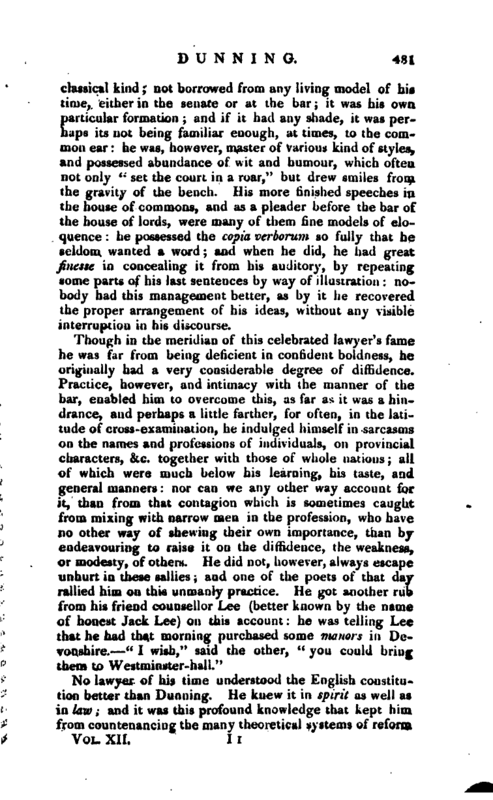 His more finished speeches in the house of commons, and as a pleader before the bar of the house of lords, were many of them fine models of eloquence: he possessed the copia verbprum so fully that he seldom wanted a word; and when he did, he had great Jinesse in concealing it from his auditory, by repeating some parts of his last sentences by way of illustration: nobody had this management better, as by it he recovered the proper arrangement of his ideas, without any visible interruption in his discourse. He preserved the dignity of a barrister very much in court, and frequently kept even the judges in check. 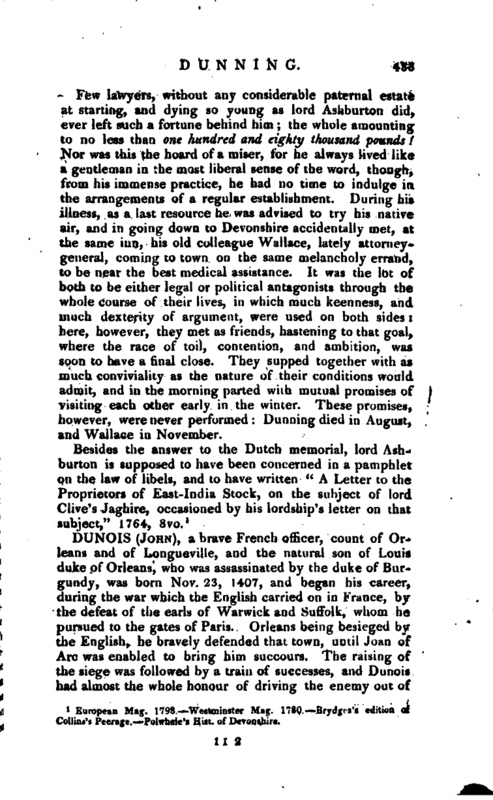 When lord Mansfield, who had great quickness in discovering the jut of a cause, used to take up a newspaper by way of amusing himself, whilst Dunning was speaking, the latter would make a dead stop. This would rouse his lordship to say, “Pray go on, Mr. Dunning.” “No, my lord, not till your lordship has finished.” His reputation was as high with his fellow-barristers as with the public; he lived very much with the former, and had their affection and esteem. 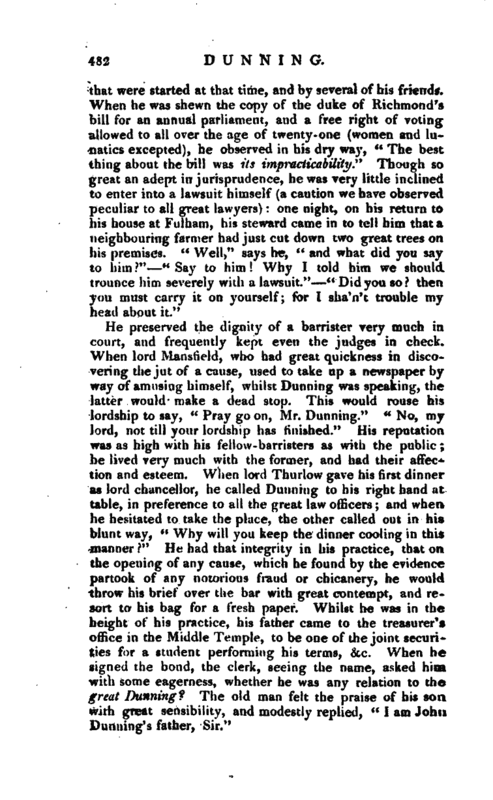 When lord Thurlow gave his first dinner as lord chancellor, he called Dunning to his right hand at table, in preference to all the great law otBcers; and when he hesitated to take the place, the other called out in his blunt way, “Why will you keep the dinner cooling in this manner?” He had that integrity in his practice, that on the opening of any cause, which he found by the evidence partook of any notorious fraud or chicanery, he would throw his brief over the bar with great contempt, and resort to his bag for a fresh paper. Whilst he was in the height of his practice, his father came to the treasurer’s office in the Middle Temple, to be one of the joint securities for a student performing his terms, <kc. Wh<-n he signed the bond, the clerk, seeing the name, asked him with some eagerness, whether he was any relation to the great Dunning? 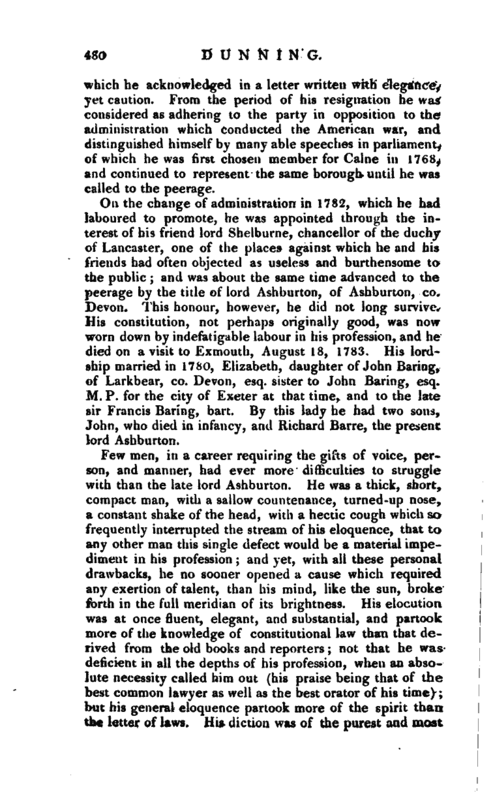 The old man felt the praise of his son with great sensibility, and modestly replied, “I am John Dunning’s father, Sir.” | Few lawyers, without any considerable paternal estate at starting, and dying so young as lord Ashburton did, ever left such a fortune behind him; the whole amounting to no less than one hundred and eighty thousand pounds! Nor was this the hoard of a miser, for he always lived like a gentleman in the most liberal sense of the word, though, from his immense practice, he had no time to indulge in the arrangements of a regular establishment. During his illness, as a last resource he was advised to try his native air, and in going down to Devonshire accidentally met, at the same inn, his old colleague Wallace, lately attorneygeneral, coming to town on the same melancholy errand, to be near the best medical assistance. It was the lot of both to be either legal or political antagonists through the whole course of their lives, in which much keenness, and much dexterity of argument, were used on both sides: here, however, they met as friends, hastening to that goal, where the race of toil, contention, and ambition, was soon to have a final close. They supped together with as much conviviality as the nature of their conditions would admit, and in the morning parted wiih mutual promises of visiting each other early in the winter. These promises, however, were never performed: Dunning died in August, and Wallace in November. European Mag. 1798.—Westminster Mag. 1780.-Brydges’s edition of Collins’s Peerage.—Polwhele’s Hist. of Devonshire.